Every industry has at least one. Automobiles had the Edsel. PC Hardware had the IBM PCJr and the Microchannel bus. In the software world, there’s Bob. If you don’t remember him, Bob was Microsoft’s 1995 answer to why computers were so darn hard to use. [LGR] gives us a nostalgic look back at Bob and concludes that we hardly knew him. Bob altered your desktop to be a house instead of a desk. He also had helpers including the infamous talking paper clip that suffered slings and arrows inside Microsoft Office long after Bob had been put to rest. It seems that most of the electrical engineering covered on Hackaday concerns exactly one problem domain: how to blink a bunch of LEDs furiously. There are plenty of LED drivers out there, but one of the more interesting in recent memory came from ISSI in the form of a chip that turns I2C into a Charlieplexed LED array. You may have seen this chip — the IS31FL3731 — in the form of an Adafruit LED matrix and some stupid thing some idiot made, but with it you’re only ever going to get 144 LEDs in an array, not enough if you want real blinky bling. Now ISSI has released a more capable chip that turns I2C into many more Charlieplexed LEDs. The IS31FL3741 will drive up to 351 LEDs in a 39×9 matrix, or if you’re really clever, an 18×18 single color LED matrix. Features of this chip include reverse/short detection for each individual LED, 8-bit PWM, dimming functions, a de-ghosting feature that guarantees a LED is either on or off, a configurable row/column matrix, and a few other handy tools that you would like to see in a LED matrix driver chip. The most impressive chip in this series will be available for under $2/piece in quantities of 2500, although unlike the IS31FL3731, it appears this new chip will only be available in a QFN package. Speaking from experience, this is a really great chip for driving a whole boatload of LEDs, provided you have a pick and place machine. Yes, you can hand-solder a QFN and several hundred 0402 LEDs, but I wouldn’t recommend it. I really, really wouldn’t recommend it. That said, this is the perfect chip for maximum blinky bling, and the press material from ISSI gives us the great idea of using one of these chips as the backlight controller for RGB LED mechanical keyboards. That’s a great application, and the chip is pretty cheap, too. You can check out ISSI’s blinky demo video of this chip below. If you are a maker, chances are that you will be exposed to unhealthy fumes at some point during your ventures. Whether they involve soldering, treating wood, laser cutting, or 3D printing, it is in your best interest to do so in a well ventilated environment. What seems like sound advice in theory though is unfortunately not always a given in practice — in many cases, the workspace simply lacks the possibility, especially for hobbyists tinkering in their homes. In other cases, the air circulation is adequate, but the extraction itself could be more efficient by drawing out the fumes right where they occur. The latter was the case for [Zander] when he decided to build his own flexible hose fume extractor that he intends to use for anything from soldering to chemistry experiments. Built around not much more than an AC fan, flex duct, and activated carbon, [Zander] designed and 3D printed all other required parts that turns it into an extractor. Equipped with a pre-filter to hold back all bigger particles before they hit the fan, the air flow is guided either through the active carbon filter, or attached to another flex duct for further venting. You can see more details of his build and how it works in the video after the break. Workspace safety is often still overlooked by hobbyists, but improved air circulation doesn’t even need to be that complex for starters. There’s also more to read about fumes and other hazardous particles in a maker environment, and how to handle them. The greatest enemy of proprietary hardware and components is time. Eventually, that little adapter cable or oddball battery pack isn’t going to be available anymore, and you’re stuck with a device that you can’t use. That’s precisely what happened to [Larry G] when the now antiquated 7.2V NiCd batteries used by his cordless drill became too hard to track down. The drill was still in great shape and worked fine, but he couldn’t power the thing. 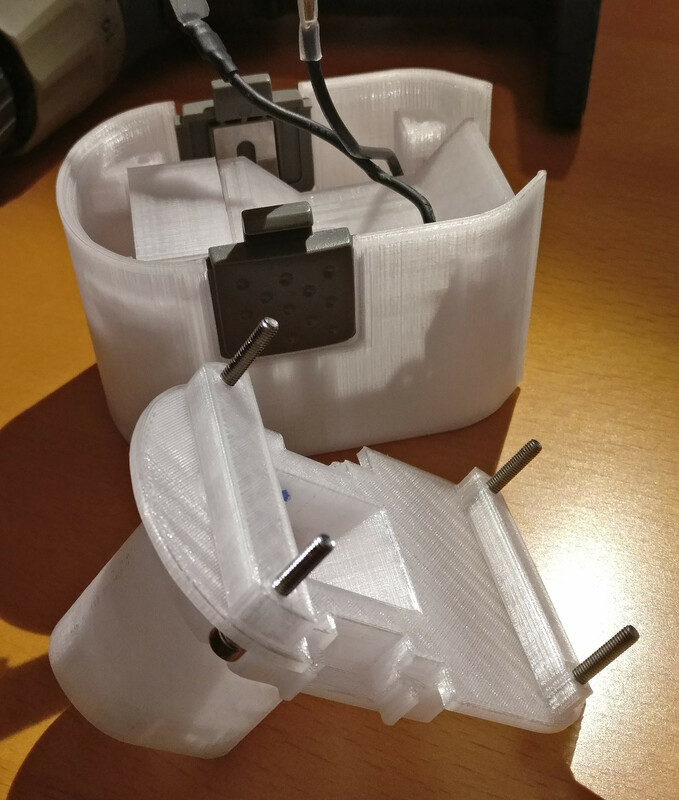 Rather than toss a working tool, he decided to 3D print his own battery pack. He could have just swapped new cells into his old pack, but if you’re going to go through all that trouble, why not improve on things a little? Rather than the NiCd batteries used by the original pack, this new pack is designed around readily available AA NiMH batteries. For the light repairs and craft work he usually gets himself into, he figures these batteries should be fine. Plus he already had them on hand, and as we all know, that’s half the battle when putting a project together. Interestingly, the original battery pack was wired in such a way that it provided two voltages. In older tools such as this one, this would be used for rudimentary speed control. Depending on which speed setting the drill is on, it would either connect to 4 or 6 cells in the original pack. [Larry] didn’t want to get involved with the extra wiring and never used the dual speeds anyway, so his pack only offers the maximum speed setting. Though he does mention that it may be possible to do PWM speed control in the battery itself via a 555 timer if he feels like revisiting the project. [Larry] tells us the pack itself was rendered completely from scratch, using only the original battery pack and trial-and-error to get the fit perfect. He reused the side-mounted release buttons to save time, but otherwise everything is 3D printed in PETG for its strength and chemical resistance. The twenty best projects will receive $100 in Tindie credit, and for the best projects by a Student or Organization, we’ve got two brand-new Prusa i3 MK3 printers. With a printer like that, you’ll be breaking stuff around the house just to have an excuse to make replacement parts. On January 21st, 2018 at 1:43 GMT, Rocket Lab’s Electron rocket lifted off from New Zealand’s Mahia Peninsula. Roughly eight minutes later ground control received confirmation that the vehicle entered into a good orbit, followed shortly by the successful deployment of the payload. On only their second attempt, Rocket Lab had become the latest private company to put a payload into orbit. An impressive accomplishment, but even more so when you realize that the Electron is like no other rocket that’s ever flown before. Not that you could tell from the outside. If anything, the external appearance of the Electron might be called boring. Perhaps even derivative, if you’re feeling less generous. It has the same fin-less blunted cylinder shape of most modern rockets, a wholly sensible (if visually unexciting) design. The vehicle’s nine first stage engines would have been noteworthy 15 years ago, but today only serve to draw comparisons with SpaceX’s wildly successful Falcon 9. But while the Electron’s outward appearance is about as unassuming as they come, under that jet-black outer skin is some of the most revolutionary rocket technology seen since the V-2 first proved practical liquid fueled rockets were possible. As impressive as its been watching SpaceX teach a rocket to fly backwards and land on its tail, their core technology is still largely the same as what took humanity to the Moon in the 1960’s. Vehicles that fundimentally change the established rules of spaceflight are, as you might expect, fairly rare. They often have a tendency to go up in a ball of flames; figuratively if not always literally. Now that the Electron has reached space and delivered its first payload, there’s no longer a question if the technology is viable or not. But whether anyone but Rocket Lab will embrace all the changes introduced with Electron may end up getting decided by the free market. We see a huge variety of human-computer interface devices here at Hackaday, and among them are some exceptionally elegant designs. Of those that use key switches though, the vast majority employ off the shelf components made for commercial keyboards or similar. It makes sense to do this, there are some extremely high quality ones to be had. Sometimes though we are shown designs that go all the way in creating their key switches from the ground up. Such an example comes from [Brandon Rice], and it a particularly clever button design because of its use of laser cutting to achieve a super-slim result. He’s made a sandwich of plywood with the key mechanisms formed in a spiral cut on the top layer. He’s a little sketchy on the exact details of the next layer, but underneath appears to be a plywood spacer surrounding a silicone membrane with conductive rubber taken from a commercial keyboard. Beneath that is copper tape on the bottom layer cut to an interweaving finger design for the contacts. An Adafruit Trinket Pro provides the brains and a USB interface, and the whole device makes for an attractive and professional looking peripheral. You can see the results in action as he’s posted a video, which we’ve included below the break.